Akhilesh Yadav announced Next Chief Minister (CM) of Uttar Pradesh (UP) today in official announcement made by Samajwadi Party(SP). 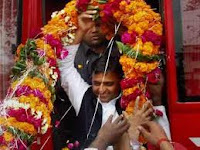 At 38, Akhilesh Yadav will become the youngest Chief Minister of Uttar Pradesh. Samajwadi Party today announced that the party members had decided that Akhilesh Yadav, party chief Mulayam Singh Yadav's son,will become the nextChief Minister of Uttar Pradesh. Akhilesh Yadav's name was proposed in meeting of newly-elected legislators and MPs by senior SP leader Mohammad Azam Khan, according to sources of the PTI. The Chief Minister elect of Uttar Pradesh will swear-in on March 12. Yadav at 38,whose namehas been formallyannounced for the state's crown, is set to becomethe youngest Chief Minister of Uttar Pradesh. Akhilesh Yadav, was first elected to the Lok Sabha from Kannauj in a by-election in 2000 andhas won three Lok Sabha electionssince then. He was the star campaigner of SP in the Assembly elections this March. SPwas the clear winner with224 seats in the 403-member UP house on March 6, after which there had been uncertainty on the decision ofwho will be theChief Minister.